Merkur Gaming invites you this time to take a highly adventurous and rewarding trip to the tropical jungle and meet the hidden tribes of Amazon rainforests along the way. Hunting for the riches, you are guaranteed to encounter Amazon tribeswomen, some rare species of wilderness like chameleons, exotic parrots, black panthers, and frogs. This delightful Merkur Gaming online slot features 5 reels and 15 paylines and is playable from $0.15 per spin. Being packed with some incredible special features like Scatters, Multipliers, Free Spins and so on, this thrilling video slot can potentially unearth a solid jackpot of $20,000. The exotic-looking slot is designed and set up in such a way to accommodate the needs of both more aspiring high-rollers and penny slots punters or simply those looking for some entertainment and fun. However, given the game’s diverse and more sophisticated features, we would say that it may be more suited for veteran punters since you need a little more than basic gaming skills to reap a substantial cash prize. This Merkur title really boasts some rewarding bonus features so you should better make the best of all that is offered here. Let us take a closer look at all of them below. The first one to be mentioned is definitely the game’s Wild symbol, represented as the native Amazon lady. It can substitute for all other symbols on the reels except for two kinds of Scatters. If you are fortunate enough to land 5 Wild symbols on a winning payline, you will receive the staggering $20,000 reward. The next one to be taken into consideration is certainly the waterfall icon. It is acting as the game’s Scatter symbol that will bring payouts wherever it appears on the reels. If you happen to spot 5 of those anywhere in view, you can win up to incredible $3,000. On top of that, there is also another Scatter icon represented by a temple. They can award you with a mystery win if you manage to land three of them anywhere on the reels. The prize can go up to amazing 300x your stake. Moreover, to trigger the Free Spins feature, you are required to land 5 sleeping panther symbols that actually stand for bonus symbols. This feature can provide you with up to six free spins along with an incredible 5x multiplier! Bear in mind that all winning combinations created during the Free Spins feature will have the 5x multiplier at the end of the round. Finally, you can further spice thing up by launching the Gamble feature. There, you will come across a deck of cards and your task will be to guess the color of the next card drawn. In this mini-game, you can choose to either gamble only a half or all of your winnings. If you opt for the Gamble Ladder feature, you will be required to work your way up the ladder containing various winning values. Needless to say, the gamble features are optional and you are free to skip them if you don’t want to take any risks and continue with the game. 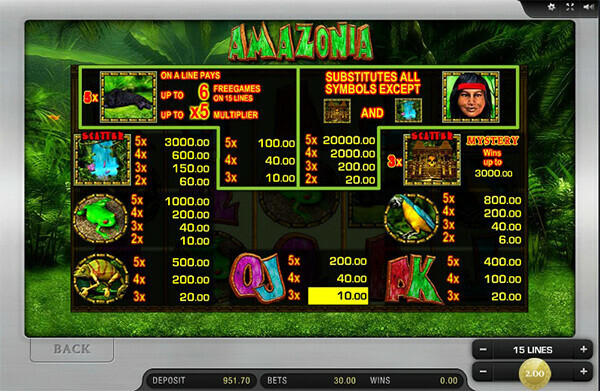 It is very difficult to find a drawback in the Amazonia slot machine given all the astonishing features it brings. Anyhow, the only possible downside could be the fact that it’s not as diverse, rich, and advanced when it comes to graphic material. Nonetheless, that can hardly divert our attention from all the other amazing characteristics offered so it is no doubt worth a spin! Overall, this Merkur title provides plenty of chances for winning decent cash prizes, even with little stakes included. 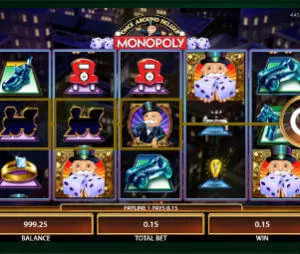 Also, the terrific Free Spins feature along with its 5x multipliers is something you should pay close attention to if you aspire towards more generous cash rewards. The 96.95% RTP is another reason why you should give it a try in real money mode and see if you can find your way out of the rainforest loaded with mind-blowing payouts!